I WONDER – What will it be like to lie in my cradle called the Grave? Will my grave be so narrow that my ribs are crushed together? Or will there be a shining light from Jannah (Paradise) forever to stay? Will there be my Qur’an warding off the Angels Munkar and Nakeer (the Angels who question in the grave)? Or will there be the deadly bugs eating my body till my bones decay? Will there be the prayers of my children whom I had taught the word of Allah (سبحانه و تعالى)? Will they be the Sadqah-e-Jahriah (ongoing charity) because I taught them how to pray? Or will there be memories of those whom I have hurt and have done zulm (injustice) upon? Are they now rejoicing because I have finally gone away? Death has finally come to relieve me from the torments of the prison of the world. This was the end for my soul had to depart. And for this there was no delay. 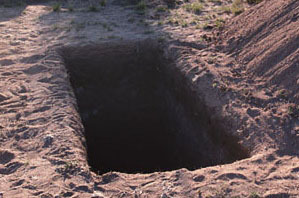 How will be my grave? Oh! How do I close my eyes and imagine it? Will I be comfortable in my bed, I wonder how will I lay? Do I not wonder how I can walk so arrogantly on the earth today? The final abode will be Heaven or Hell – That will be the permanent stay! Oh Allah! – save me from the torments of the grave and the Hellfire. Make me one whose face is shining radiantly, so happy and so gay. This entry was posted in Reflections and tagged Afterlife, Agonies of the grave, death, Final Abode, grave, Heaven, hell, Munkar and Nakeer, Munkar Nakeer, Quran, Sadqah-e-Jahriah, torments of the Grave. Bookmark the permalink. This is a very important reflection to think about because it talks about the grave and we should think about where will we go Jannah or Hell. The visual of the grave realy got me thinking———–we have recently had a death in the family and i often think of my cousin and her state,though she was actively involved with the Qur’an.The absence of light and company make me fearful and make me reflect as to how do i make this eventual abode of mine a better place, the answer lies in making the right choices keeping the akhra in mind and Allah(swt) Pleasure as the prime focus.This indeed is one of the many Blessings of the Qur’an.Alhamdulillah.